Q: I talked to Al Papik recently and he talked about coaching against you when you were a college player. I told him I would love to see some of that game film. (laughs) Now, society doesn’t necessarily esteem or promote the necessity of support from spouses today. Can you tell me the ways your wife Nancy best supported you? TO: Well, Nancy is somebody who was very encouraging, to do whatever I, whatever we thought was best, and was a great coach’s wife. Because there are times when there are three kids and the coach is absent. Sometimes the PTA meetings, sometimes the games -I went to every one I could- but there were times during the season that I couldn’t. And she shouldered that burden and did a great job and also always had a good attitude. You know, sometimes when the press was on you or things weren’t going well, she still maintained a good balance, and I thought that was always very helpful to not come home to more criticism or problems than what you were already dealing with. So that was helpful to have someone like Nancy. She was a great coach’s wife and has been great over so many years. Q: Can you tell me: how did you know that you were fully prepared for a game? Was there ever an occasion in that process when you said to yourself, “Okay, I’ve put my study in. I’ve fully prepared. As a staff we’ve put our time in and feel secure about things now”? TO: Well, we would go through a certain process: The game film would be broken down on our opponent the week before the week we played them, so we’d get all the game film in and graduate assistants and various people would chart offense, defense, and have a computer printout for us on Sunday afternoon. We’d get started on it, and then we would do certain things throughout the week: we’d have a quarterback audible sheet, alter our pass patterns if we were going to change anything. They were always done by Monday. We’d always have the computer printout in regard to tendencies and we’d put a game plan together and practice schedule and on and on. But you still never knew for sure. You might occasionally. Because of the style of offense we ran, we’d come out and first series we’d find out they were lined up on defense with something they’d never shown all year, that we hadn’t worked on at all that week, because there was no way to anticipate it. But we had enough experience as a staff and had enough institutional knowledge to draw on that we could think about maybe what we had done when something like that had happened four years before, five years before. So I think we were a staff that was able to adjust during a game quite well. Sometimes people get locked into a game plan and they’re gonna stick with that game plan no matter what; sometimes the game plan goes out the window that first two or three minutes and you’re gonna adjust. Q: Any particular games come to mind as far as that happening? TO: Well, I can remember one time we played Kansas up here and they basically came up in an 8-man front and they essentially were challenging us to run wide, and so we did some things and eventually we figured out some ways to pick it apart: some trap plays and a few passes. And when we played Tennessee that last game I coached, I think they had eleven people within 3 or 4 yards of the line of scrimmage that first series and just stuffed the run. I think we threw four straight passes the next series and completed every one of them, and they backed off and we ate ’em up. We might have had close to six hundred yards that game. My feeling is if they’d stayed with what they had originally lined up in they’d have given us a harder time, but they got taken out of it when we hit the passes. So that’s just the way it was. There were times when people played pretty vanilla and played the way you had practiced & what you had expected, and there were times when they just felt we were so good on offense or defense they figured they might as well roll the dice and come up with something that we’d never seen before. Q: And let me ask you, is there anyone behind the scenes who you feel played a truly integral part in what you were able to accomplish, someone who’s never fully gotten their due? TO: Well, over the years I think Boyd Epley was important because he really brought to the forefront the importance of strength training and offseason conditioning. Boyd was always, I thought, ahead of the curve a little bit. When people were emphasizing just power lifting, he began to get into explosiveness and quickness and agility and those kinds of things, so I thought he always helped provide us with an advantage. Jack Stark in those later years was helpful in helping formulate the idea of the Unity Council and some of those things that worked. But there was no one person or one thing. A lot of it was the players themselves. They had a lot of pride in what they were doing and forced things internally. They had a pretty strong sense of ownership of the program and they didn’t want to have anyone stand in their way to be successful, so they just didn’t tolerate people who’d deliberately not be with the program. Q: They’d taken some things off of your plate, so internal control wasn’t bogging you down every day? Q: And I have to ask, do you have any memorable or comical moments that make you giggle to this day? TO: Well, I thought we tried to have a fair bit of fun playing football. It wasn’t all strictly business. 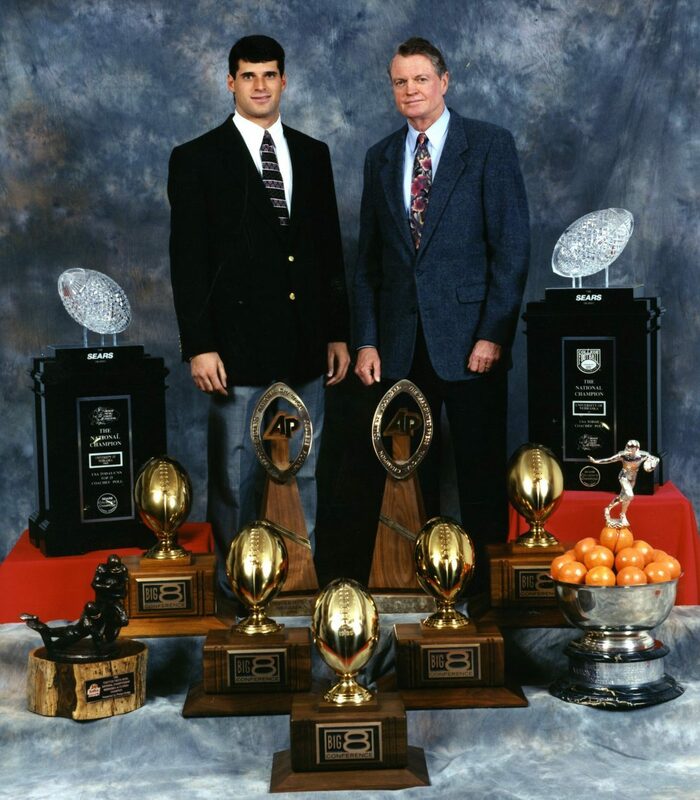 I remember Christian Peter and I threw our trainer Doak Ostergard into the pool down at the Fiesta Bowl one year, and a few things like that that happened that were kind of interesting, kind of fun. Q: And if one were to invest in a time machine, is there anything you wish you had the chance to do over again? Tweak? Change? Do differently with the knowledge you have now? TO: Well, I think that probably my leadership style evolved and changed over the years, which is natural. The more you do something the more you reflect on it, and probably I was a little bit different coach and leader in the ’90’s and ’80’s than I was in the ’70’s. 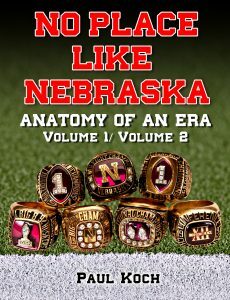 When I started out in 1973 I was 35 years old and there was a lot of pressure to come somewhere close to what Bob Devaney had done. And Bob had set the bar very high, so there was a natural tendency to focus on performance and winning, and I think as time went on I focused more and more on the process. I probably got better at listening to people and understanding people better. But that’s just sort of a natural evolvement over time, I think. Q: Have you found any time for fishing lately? TO: Yeah, I still get away. I try to go. In the summer I get away for a couple weeks for a couple days to do some fishing. But that’s just about to end here. Once August starts you can’t do a whole lot of that. Q: If I recall, one of your favorite spots is up near Merritt Reservoir by Valentine, right? TO: Yeah, although I haven’t been up there for about 4 years. But I do fish some on the Snake River up there below Merritt Dam, that’s pretty good. Q: I have to know, do you still rise early in the morning for prayer, meditation and scriptures? TO: Yeah, when I was coaching our meetings always started at 7, so I’d get up at 5:30. Now I probably get up about 6 and do the same thing. But, yeah, I start my day that way. Q: Do you have a favorite Bible verse, a scripture verse that you latched onto and always held a little closer than most? TO: Well, yeah, I had several. But one I come back to quite a bit is Second Timothy 1:7, that says, “for God has not given us a spirit of timidity, but of power and love and self-discipline.” I think that probably is something that’s fairly appropriate to an athletic arena. And Hebrews 12:1-2, “Surrounded as we are by so great a crowd of witnesses, let us cast aside every hindrance and the sin that so easily entangles and run with perseverance the race set before us, keeping your eyes fixed on Jesus Christ, the Author and Perfector of our faith.” That’s another favorite of mine. Q: That Second Timothy verse is one my favorites, also. Last question, Coach: it’s about the concept of emotional intelligence. You never designated someone else to be a full-fledged offensive coordinator, but rather took that on in addition to all of the other head coaching hats you wore. Were you purposefully cognizant of all those tasks from the outset and did you have to work on developing the capability to do so, or did you always possess the ability to take on a lot of roles simultaneously and perform them well? TO: Well, I did them all one at a time. (laughs) I never tried to do them all at the same time. I guess I wasn’t really flipping a page in my mind thinking about emotional intelligence from one thing to another, I just did the best I could with whatever I was doing and one thing led to another. So I don’t know, it’s just something that sort of evolved over time. Q: Well, I have to tell you, you have no idea how I appreciate the giving of your time… and I just want to let you know you had a profound impact on my life. I owe you a great debt of gratitude. 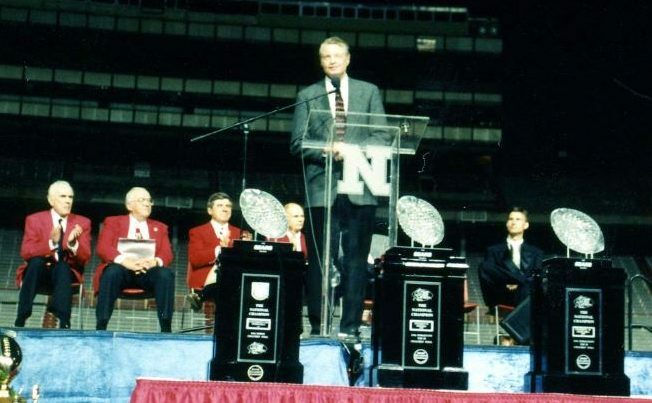 Our conversation took place just as Nebraska –with Tom as its Athletic Director- began to entertain serious thoughts about moving on to the Big Ten Conference, so Tom’s scheduling allotment for talk meant a great deal to me. I felt guilty for even requesting a few minutes of his time, but he graciously asked his secretary Anne Hackbart to work me into his day. 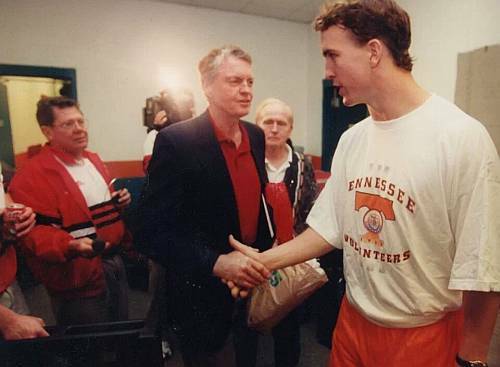 I wished it had gone on longer, but he had more important issues to deal with than a former strength staffer trying to dissect him and his former teams over a long distance telephone line. In my feeble attempt at dissection both the humility and the honesty with which he answered my queries spoke volumes. It wasn’t a fake, ‘aw shucks’ humility, either, for he spoke matter-of-factly and gave thoughtful pause to each question I brought up. I found it very refreshing when he flat out answered with an “I don’t know” more than once, too. The honesty is endearing, if not quotable. 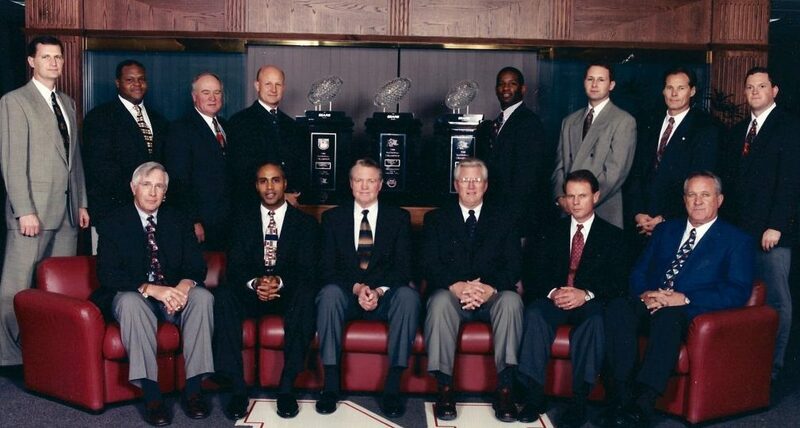 And if you must know, Tom Osborne’s humor can border on the dry to slightly sarcastic side. Sadly, this conversation didn’t allow for it to shine through as I would have liked. Perhaps that’s why so many outsiders over the years have had a difficult time getting a fix on him, for he’s an acquired taste, becoming all the more revealing the longer you’re with the guy. 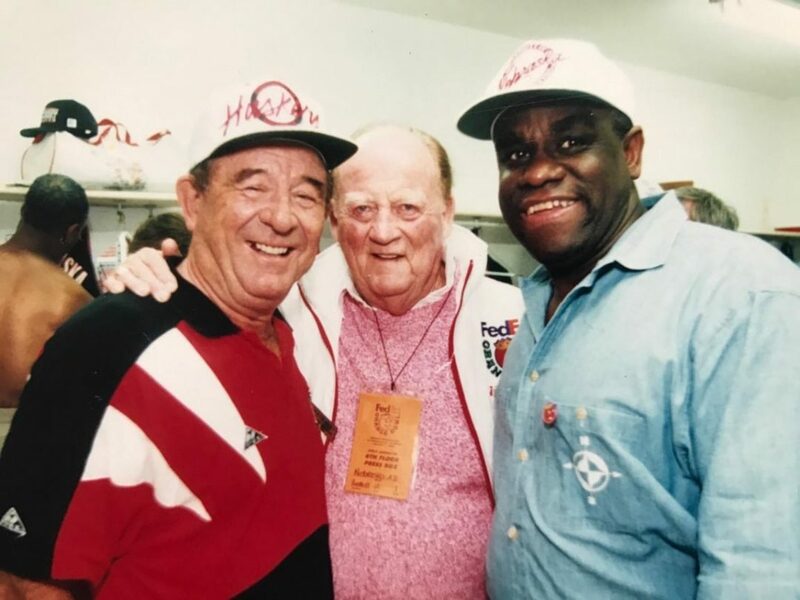 Of secondary note, it was classic ‘Tom Osborne’ when he shared one of the reasons for the 60 & 3 era’s success: “A lot of it was the players themselves. They had a lot of pride in what they were doing and forced things internally. They had a pretty strong sense of ownership of the program and they didn’t want to have anyone stand in their way to be successful, so they just didn’t tolerate people who’d deliberately not be with the program.” He reminds me of the Plutarch’s biographical sketch of Roman consul General Gaius Marius (157 BC – 86 BC) who, throwing off the entrance requirement of only land-holding men into the pre-Caesarian Roman armies, he “at once proceeded to levy soldiers, contrary both to law and custom, enlisting slaves and poor people; whereas former commanders never accepted of such.” In other words, General Marius had a deep appreciation for the ‘walk-ons’ of his day as did Coach Osborne in his. I was somewhat surprised, though, to hear his opinion of the nature of the human competitive streak when he mentioned, “it’s something that you either have it or you don’t. Some kids just naturally like to compete and challenge themselves and some people don’t.” For such an education-oriented, nurture-minded man -and a Doctor of Psychology to boot- his ‘nature over nurture’ position statement caught me off guard. Perhaps that explains why he was never a ‘rah-rah coach,’ because in his mind the game of football -offensive football at least- is more about execution and less about motivation. By recruiting athletes with a pre-existent competitive nature there would be no need to pump them up into a pre-game frenzy, as it was already an inherent article by his mind’s standard. A follow-up question I wish I’d asked is: “How were you best able to identify the great competitors from the ones only moderately so?” Then again, who’s to say what type or degree of competitor is best for athletic achievement, anyhow? Could a win-at-all-costs student/athlete be the one you want on the team? Maybe, maybe not. Perhaps you’d want a player more concerned with the process than the end result -one whose competitive nature was dialed down just a notch- maybe they’re the ones to covet most? I don’t know. I look forward to gaining a deeper understanding as we continue on with player interviews. Last off, I couldn’t help but notice a parallel to scripture verse Matthew 5:37: “Let your yes be yes, and your no be no…” He talked about his making a “commitment that I never turned away from.” From this simple turn of phrase at the end of that sentence you grasp that he places great value in honoring commitments. 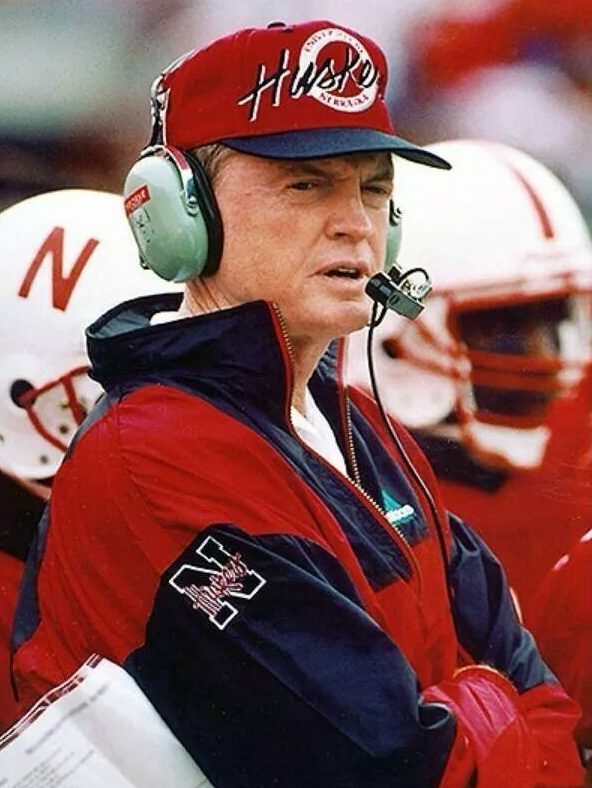 None more so than the one he made to each and every recruit whose living room he visited, because Tom Osborne always promised a kid’s parents two things and two things only: that the young man would receive a quality education and that he would be given an opportunity to compete. I don’t recall him ever turning away from those commitments in his score and five years as leader of Nebraska Football.